Publisher: Oldbourne Book Co. Ltd. Description: All stories presented in picture-strip format and illustrated in full colour. Contains instructions on how to make a leaping paper frog. All puzzles unsolved – although someone attempted Rupert's Flower Game & Puzzle on a separate sheet of paper using that page as a rest, so various flower names have become 'etched' into it. 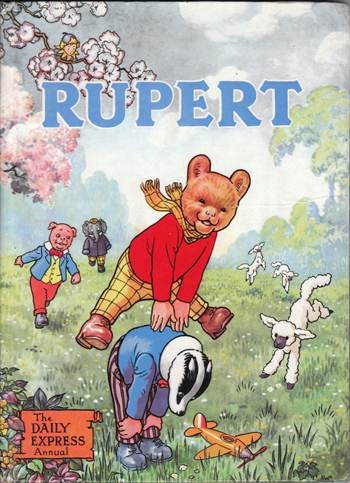 The stamp sheet is missing from Rupert's Stamp Puzzle, but the 'envelope' has not been used. The £200 Colouring Contest has been very neatly coloured in and the form completed with the previous owner's details. Illustrated pastedowns and endpapers depict a nocturnal frog chorus. Glazed pictorial boards are in excellent condition for their age. Corners are lightly bumped and there is a slight crease on the front board (refer to image). Ownership panel contains previous owner's name neatly printed in blue ballpoint. Unclipped (bears original price of 5/-). Pages in excellent, unmarked condition. No tanning or foxing whatsoever. Lovely copy of a scarce annual. Measures 10″ × 7.5″ (25.5 cm × 19 cm). 4to. 107 pp.